What's New for the 2018 Mazda CX-9? 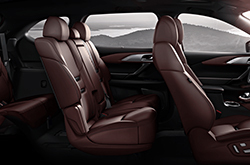 The CX-9 is the Mazda entry into the midsize crossover market with third-row seating. 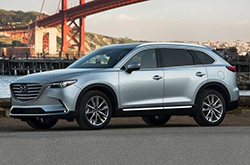 Mazda touts all of their models as being sportier than the competition, and customers desiring a crossover vehicle that emphasizes the driving experience should check out the 2018 Mazda CX-9 with its sporty steering and balanced chassis. The last major redesign for the 2018 Mazda CX-9 came in 2016, and the vehicle was not updated until the 2018 model year. For 2018, Mazda added several safety features of interest, including Smart City Brake Support auto brake system, blind spot monitors, and rear cross-traffic alert standard to all trim levels. The 2018 Mazda CX-9 base Sport trim features an impressive list of features, including adaptive cruise control, 18" alloy wheels, LED headlights and tailings, dual exhaust and a rear roof spoiler along with many other comfort and cabin enhancements like leather trim and three-zone climate control. The base trim comes with a 7-inch touchscreen display that is the hub of the Mazda infotainment system. The Touring trim adds an automatic liftgate, heated mirrors, automatic headlights, rain sensing wipers, an upgraded 8-inch touchscreen display, keyless start, and a folding armrest for the center row. Mazda Radar Cruise Control with Stop & Go is also standard on the Touring trim and above. 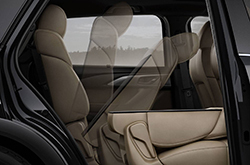 The CX-9 Grand Touring trim includes 20-inch alloy wheels, power sliding moonroof with sunshade, upgraded front, rear, and side lower body trim, aluminum roof rails, Bose audio system with 12 speakers and Sirius XM radio, a navigation system, front parking and rear backup sensors, driver's power seat memory, heated second-row seats and a heated steering wheel. The top-of-the-line Signature trim comes with all of these features and adds LED grille accent lighting, LED overhead accent lighting, luxurious Auburn Nappa leather seating and trim, real rosewood inlays and an upgraded leather-wrapped steering wheel. 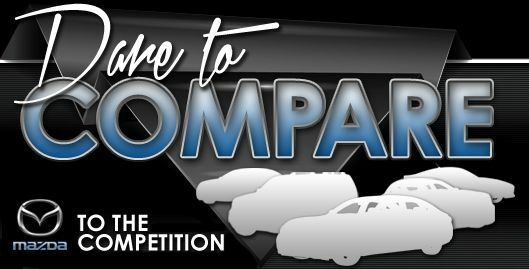 All models feature the same a turbocharged 2.5-liter four-cylinder engine coupled to a six-speed automatic transmission. This small engine boasts an impressive 250 horsepower with 310 lb-ft of torque while offering 22 mpg in the city and 28 mpg for highway driving. 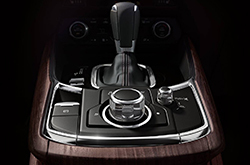 The Signature trim is only available in AWD, all other trim levels of the CX-9 come with the option of either front-wheel drive or all-wheel drive.